Beryn Schwerdt, Nathan Sapsford and Ryan Carter. Photo: Nino Tamburri. So you think your family is dysfunctional? Meet Diana and Misha, their children Alex and Mira, and Diana’s brother Boris. If you rubbed two sheets of coarse-grade sandpaper together you couldn’t generate more friction than this family of Russian immigrants living in Brooklyn. These people are verbal abuse virtuosos – and that’s allowing for English being the second language of three of them. Erika Sheffer’s rasping play is on a popular theme: the plight of the migrant adjusting to a new cultural cosmos. Here that cosmos is the American Dream, and part of her success is to craft the play without the need for any American-born characters (other than 14-year-old Mira) to escalate the conflict. This family is abundantly capable of doing that all by itself. The stick she uses to prod the nest of viperish interrelations is to thrust Boris into the fold, fresh off the plane from Russia and without having seen his sister’s family for a decade. The four were already zealously trying to get ahead their own ways, with varying levels of lying or illegality. Boris’s version of being on the make is on steroids by comparison, and appalling in nature. The play’s challenge is to deploy infinite shades of anger, and to show that behind the surface friction lie complex, thorny strata of warmth, affection and even vulnerability. Director Joseph Uchitel (for Fishy Productions) and his cast – Berynn Schwerdt (Misha), Rebecca Rocheford (Diana), Ryan Carter (Alex), Hayley Sullivan (Mira and three minor roles) and Nathan Sapsford (Boris) – largely achieve this. They sidestep the potential for a relentless shout-fest, while, from the opening lines, sowing seeds of a tension that steadily grows across two hours. Rebecca Rocheford Davies. Photo: Jeremy Ghali. Diana is the play’s epicentre: the only one to have a loving relationship with all the others, however shrewishly she may espouse that love. 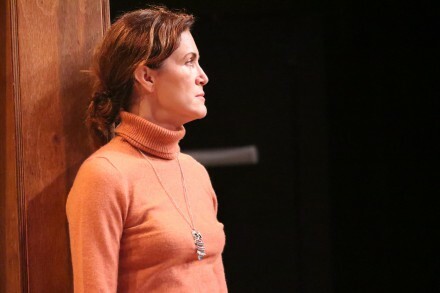 Rocheford lacked the iron core in Act One to make her character that credible epicentre, but she raised her performance in the second half, and made of the most of such delicious lines as, “I don’t suffer because of my husband, I suffer because I’m breathing”, and “za parent you want should die first never does”. Sullivan excels as the teenager stuck with a dumb, fascist family in a world exploding with possibilities. Carter moulds Alex into the play’s most intense and riven character, as he is forced to confront the difference between being on the make and destroying others’ lives. Schwerdt admirably portrays the tough-guy exterior of Misha, despite letting us glimpse the inner “pussycat” – as Boris sums him up to Alex. Sapsford catches Boris’s veneer of affability, while being able to ratchet up his menace as the play unfolds. These are all feisty people, but even so Uchitel has them verging on hyperactive too often in the way some scenes – notably the opening dinner – are blocked. Nonetheless to have orchestrated the tonal nuances of the host of seething negative emotions, and then delicately inlaid the flashes of softness, care, affection and vulnerability, especially between Diana and Misha, is a commendable achievement. Dialect coach Linda Nicholls-Gidley has helped the actors attain convincing consistency with their Russian accents, graded from the thickness of Boris’s down to the non-existence of Mira’s. 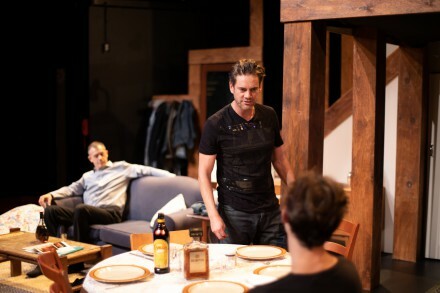 Anna Gardiner’s set efficiently (if not especially elegantly) solves the play’s demand for four discrete playing areas, and these are exceptionally lit by Martin Kinnane, while Benjamin Freeman’s sound design effectively lubricates the transitions. Already compelling theatre, one suspects its emotional gradations will become still more sophisticated.